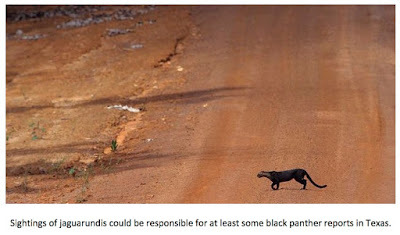 Some of you may be wondering if this blog has turned exclusively into a black panther site. The answer is no, but I understand why the question might be asked. As word has gotten out that there is somewhere to report sightings of large, black, long-tailed cats and that there is someone that will not dismiss sightings of said cats out of hand, the reports have continued to just roll in unabated. What you actually see published on this site are just some of the reports I receive on a weekly basis. It has become quite the job keeping up with them. I am working on some posts on other cryptozoological topics so, please, be patient. In the meantime, however, here are the latest reports from Texans who claim to have had run-ins with the mythic black panthers of the Lone Star State. TCH Comment: Dial sits in southeast Fannin County along FM 824 about 25 miles to the southeast of Bonham. The Sulphur River flows west to east less than 5 miles from the small, unincorporated community. The land is almost exclusively reserved for agricultural purposes in the immediate vicinity and features the aforementioned Sulphur River, numerous creeks and ponds and heavily wooded riparian greenbelts. A large cat would have plenty of room to roam and thrive. The behavior described is something that rings true. Many would, no doubt, testify that they have seen domestic cats lying on top of warm car hoods during cold snaps. I see no reason a larger cat might not do the same thing during an unusually cold weather event (temperatures in the 20’s in Texas certainly qualify). TCH Comment: Dimmit County sits in south Texas along the Rio Grande River. The county seat is Carrizo Springs. The county consists of 1,335 rather lonesome square miles. There are only 8 people per square mile in the county. Mountain lions can be found in the region so a big cat could make a living here. 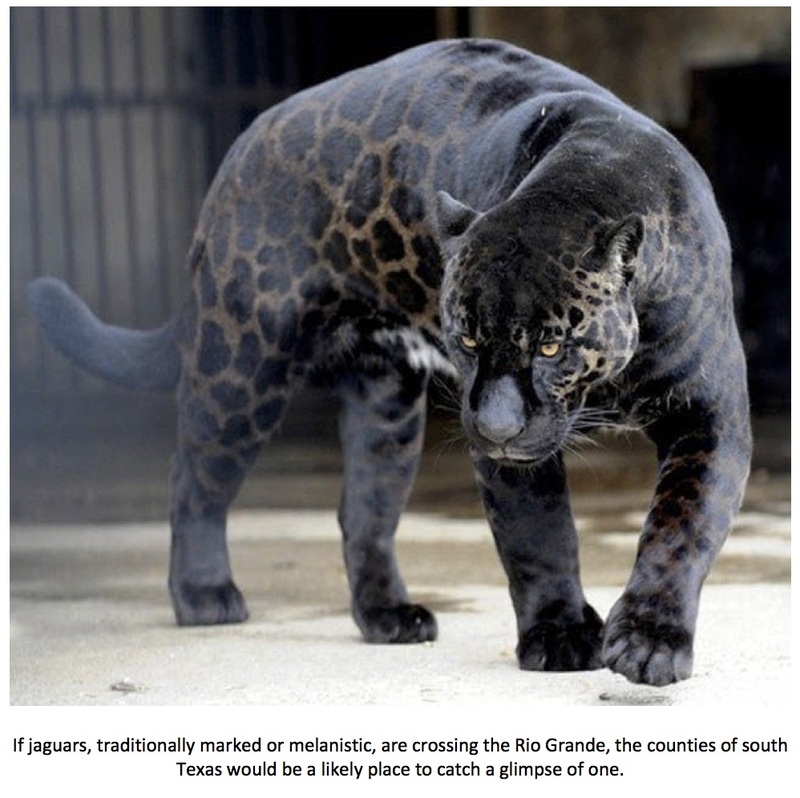 It is possible that a melanistic jaguar could cross into from Mexico in this area. I am troubled a bit by a big cat that chose to go under a fence rather than over it. Before adding this sighting to my distribution map I would like to hear a bit more from Eduardo about the location of the fence, how a big a barrier it is, etc. TCH Comment: It is an interesting story, I am always up for interesting stories. I have received a few sighting accounts from the northeastern region of the country so it is not as unlikely an incident as many might believe. Since it is far from my stomping grounds it will not appear on my distribution map. TCH Comment: Tyler County is located in east Texas in the region commonly called the Piney Woods. This is also one of the areas where units of the Big Thicket National Preserve can be found. 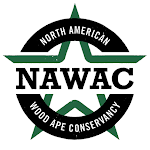 The area has historically been rich in wildlife and cryptozoological lore. The area once held populations of red wolves, cougars and black bear. Two of these three species seem to be making a bit of a comeback in the area. The area is also rife with tales of black panthers. Nathan’s sighting is typical of most sightings of large cats in that it occurred quickly and not under ideal light conditions. I have no doubt that Nathan saw a big cat but, due to the fact he cannot positively state what color the animal was, I will not post this report on my distribution map. Thank you for taking time to send me this report, Nathan, and thank you for your service. “I am a retired Forester w/ private industry in Arkansas and have been witness to LBC (large black cats) on 3 different occasions. 2 of the 3 were in the fall of the year during the hunting season here in S/W Arkansas. One was seen from my elevated deer stand located along a large creek approx. 1/2 mile from any paved or gravel road. The animal approached w/in 25/30 yards of my stand giving me a clear and unobstructed view. It was a large cat. The 2nd sighting was while I was "cruising" timber south of Fouke, Ark., supposed home of the 1970's Fouke Monster. While cruising timber in the Sulphur River basin I also saw a LBC. I had a feeling of being watched and followed so I stepped behind a large cypress tree and waited. Just a few minutes later the cat stepped out of a cane break approx. 50 yards from me. I let out a squall and he swapped ends and disappeared back the way he came. I also left the woods. The 3rd incident was from my truck w/ a friend as a witness. David Satterwhite and I were leaving the woods heading to his house to cook out. It was just before dusk dark when he stepped out of the woods onto the gravel road we were driving. At approx. 75 yards he/she (not knowing what gender any of the three were) stopped for a short 4 or 5 seconds and then jumped a wide ditch and disappeared into the thicket and gone...To surmise I know that these type cats are here. Are they just in transit or do they call this part of Arkansas home is yet to be determined. I am no "expert" as to judge this, but I know what I witnessed, and I do know the local fauna, they were not bears, Labrador dogs, or feral house cats. Until science take these sighting serious we may never know until someone is attacked by one of these mystery cats." TCH Comment: These incidents took place in Arkansas, so they will not be placed on my sightings distribution map but they are, nonetheless, fascinating. I cannot think of many whose eye-witness testimony would be more compelling than a career Forester. 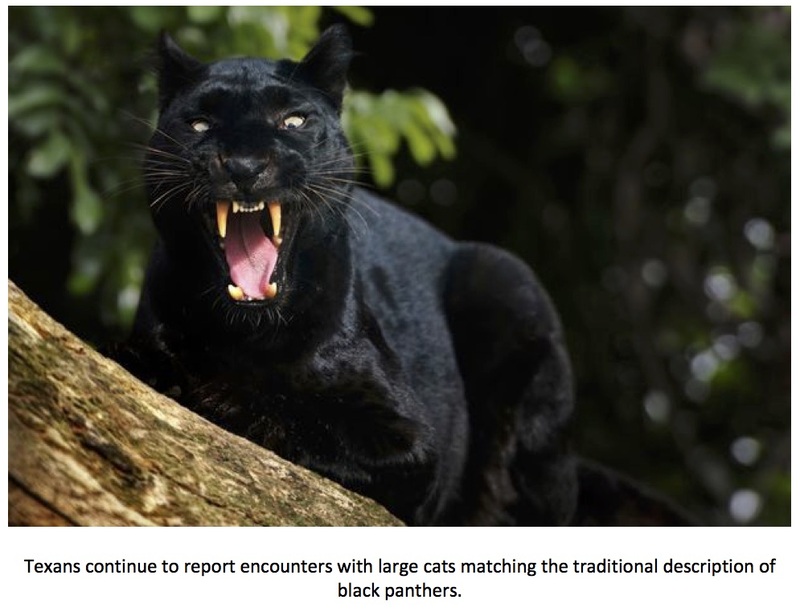 TCH Comment: The sighting area is in Tarrant County which, to the surprise of many, has been a hotbed for black panther sightings. The witness states that he was working nights and spotlighted the cat in question. These factors clearly indicate the sighting took place in less than ideal light conditions. These things being the case, we must keep the possibility of the misidentification of a large domestic/feral cat on the table. That being the case, I will leave this sighting off my distribution map. The witness does say a short video was taken. I would be more than willing to reconsider my decision if I could get a look at that video so, Clay, if you see this and still have that video please email me at Texascryptidhunter@yahoo.com. TCH Comment: Atascosa County is just south of Bexar County – home of the great city San Antonio – and not too far from accepted jaguarundi range. That being the case, it is not outside of the realm of possibility some of these wild cats could have ventured inland to this area. I would advise the witness to have a camera handy in case any future sightings take place. 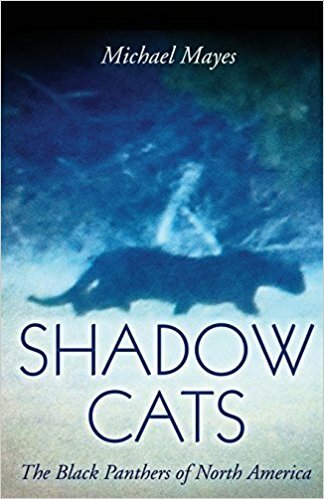 TCH Comment: A very typical sighting where the witness caught a fleeting glimpse of one of these enigmatic shadow cats. The witness failed to say exactly where this sighting took place so I am unable to add it to my distribution map. “Very interesting accounts. I have heard of the black panthers mostly in east Texas for years. Years ago, as a young boy, probably around 1966 in the Klein area North East of Tomball Texas I was riding my horse through the deep woods N of Willow Creek South of Spring Creek on an old logging road. My horse started acting extremely nervous and agitated. I was getting angry with him when he turned partway around and I saw the back half of a black panther. It was very sleek and muscular with a long tail. It was bigger than a bobcat but not as big as a cougar. I have hunted those woods for years and never saw another one but can tell you for a fact I did see that one on that early summer day 1966. TCH Comment: I have heard many similar stories from my fellow east Texans. While there is less forest than there used to be in the region, there are still thousands of acres of wooded land in the region. This particular sighting took place in very close proximity to the Sam Houston National Forest and the primitive Big Thicket, an area rich in black panther lore. I will be adding this sighting to my distribution map. TCH Comment: Kosse is a small town in Limestone County. The county is looked at by many as a transitional area where central Texas becomes east Texas. The area around Kosse is extremely rural, lightly populated and has been a hotbed of sightings for large, black, long-tailed cats. If the witness in this case is correct, and I have no reason to believe he is not as his truck provided scale, this was an enormous cat. There is simply no way he or his wife could have mistaken an approximately 150 lb. cat with a domestic/feral or a jaguarundi. This sighting will join others from the Kosse area on my distribution map. TCH Comment: Another sighting from the Sam Houston National Forest/primitive Big Thicket area. The sighting itself is nothing spectacular, just an animal crossing a road, with the exception of the fact that the animal seen is not supposed to exist. I will be adding this sighting to my distribution map. “Years ago I lived in Blackwell, TX which is about 35 miles south of Sweetwater. I had to drive into Sweetwater for work and then home again, many times in the dark. I was always wary of deer and kept a sharp eye out. But one morning as I neared the intersection for Nolan (also called Divide), I saw very clearly a black panther, black as midnight, and the size of a fairly large dog cross the road in front of my car. I had plenty of time to watch it cross the road. It was in no real hurry, just crossed at a fair pace. I had always heard the local farmers knew there was a big cat in the area......but I finally saw it. We had lived in the area about a dozen years, that was the only time I saw for myself." TCH Comment: The sighting location sits in southeastern Nolan County southwest of Sweetwater. It is an area that has been the source of black panther reports in the past. The county is lightly populated – only 17 people per square mile according to the 2000 census – so there is plenty of room for a large cat to roam and remain largely undetected. This is yet another road crossing type of sighting, very typical. 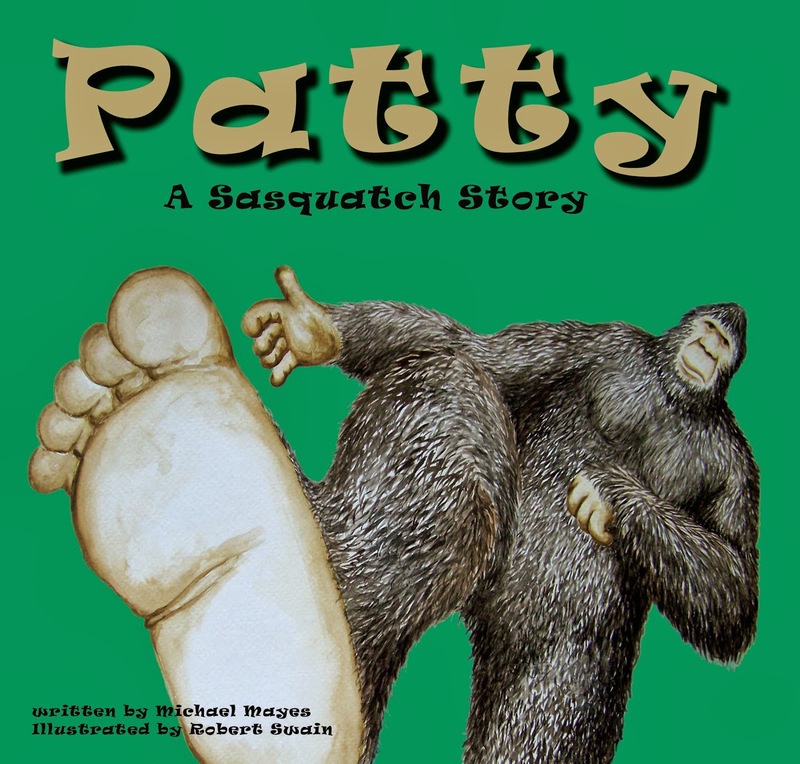 The witness was able to get a good long look at the animal as it crossed in front of his vehicle so the possibility of a misidentification seems remote. I will be adding this sighting to my distribution map. TCH Comment: Details are sparse on this one so I will leave the report off my distribution map; however, the witness raises a question that has been asked of me before so I will take this opportunity to address it. 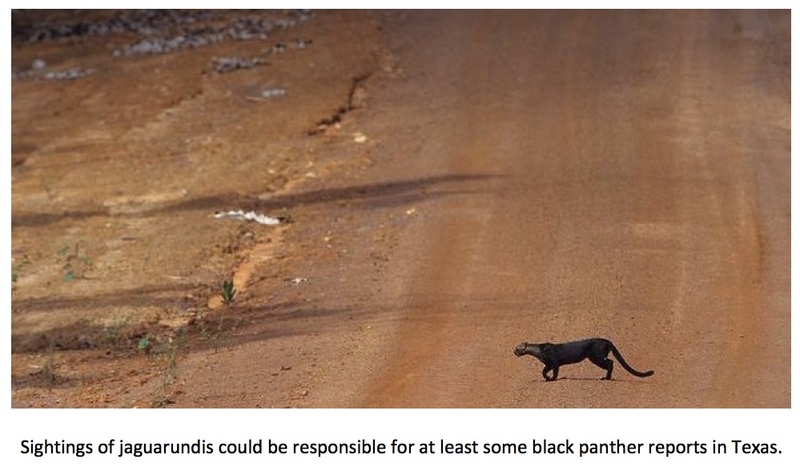 Can you kill a “black panther” without fear of prosecution? The answer is yes…and no. IF these long-tailed black cats turn out to be a novel species, then no prosecution would be forthcoming. As of now, the black panther is thought to be about as real as a unicorn to wildlife officials. There are no laws against killing “imaginary” animals. IF the cat in question turned out to be a mountain lion (I know there is not supposed to be any such thing as a melanistic cougar but play along for a moment) then the only requirement would be that the hunter possess a valid hunting license. There is no closed season on mountain lions in Texas. 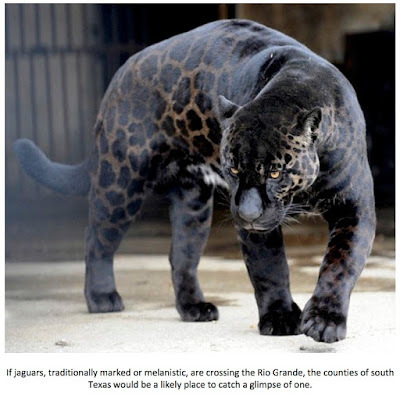 The only way a Texan might face prosecution for taking one of these cats would be if the animal in question turned out to be a jaguar or jaguarundi. Both are considered endangered or threatened and a person responsible for the killing of one of these cats could potentially face prosecution that could lead to jail and/or heavy fines. The exception to this scenario would be if a person could prove that their life or the life of a friend or family member or that of their livestock was in imminent danger at the time the shooting took place. Hopefully, I did not muddy the waters too much with that answer. At this point I would like to put the call out to anyone and everyone that has a photograph of what they suspect is one of these mystery cats. In addition, I would like to request that you, the reader, spread the word on where sightings of black panthers can be reported. Remember that an email is a better and more efficient way to communicate with me than relating an experience via a comment on another post. The email makes a two way conversation possible. I can be reached at Texascryptidhunter@yahoo.com.